A quinoa salad loaded with grilled bell peppers, zucchini, asparagus, snap peas, broccoli and corn makes a healthy and delicious light summer meal. During the warmer months, I have a tendency to buy way too many vegetables and fruit. Everything just looks so darn good and you can’t beat the lower prices. Plus, since I’m bringing along my two munchkins who don’t always make grocery shopping the easiest, I’d rather grab as many things as I can in that one trip than have to make the trek to go back in case I forget anything. Sometimes I go a little bit too overboard and on those weeks I forget we have dinner plans or are out of town visiting family, the produce ends up going bad before I get a chance to use it. I hate having to waste food. Unfortunately, there are some weeks I can’t always beat the clock and cook or eat every ingredient in my produce drawer fast enough. That’s why I was thrilled to try out OXO’s new line of GreenSaver boxes! They are awesome food storage units that help keep your produce fresher longer. Did you know that 25% of the fresh fruits and vegetables purchased by U.S. Consumers are wasted annually before being consumed? Ethylene Gas – Fruits and vegetables give off ethylene gas which speeds up the ripening process and causes over ripening and produce to go bad. Improper Airflow – When produce rests against the walls of storage containers, bags and crisper drawers, moisture can build up and cause rotting. Uncontrolled Humidity – every fruit and vegetable requires a perfect balance of humidity to stay crisp and prevent wilting and different kinds of product require different humidity levels. 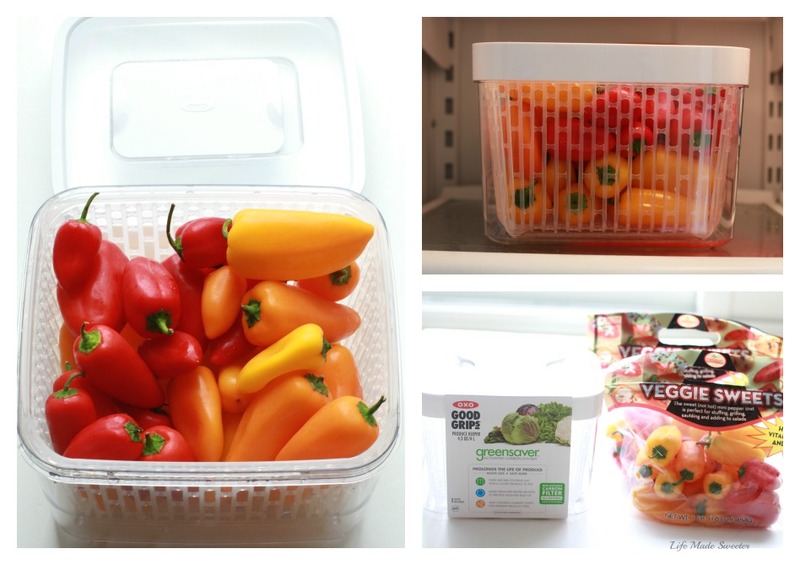 The OXO GreenSaver line of products uses a unique system to keep produce fresher, longer. They are made with special carbon filters that can absorb ethylene gas, promote airflow and control humidity. I tested out the storage unit with some fresh sweet peppers sent to me from Melissa’s Produce. The peppers fit perfectly in the produce keeper and tucked away neatly in my fridge. The peppers stayed nice and plump even after more than a week in my fridge. Our dinners have been really simple lately and involve lots of grilling -I love summer time grilling since it gets us out of the hot kitchen. One of the dishes we made was this Grilled Vegetable Quinoa Salad. This salad is simple to customize with any vegetables you have on hand. 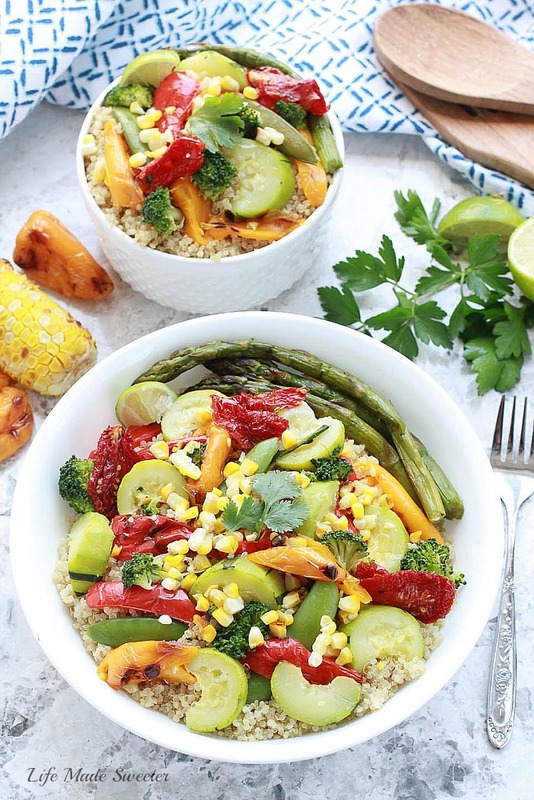 We used a mix of the sweet red, orange and yellow peppers along with some zucchini, broccoli, asparagus, sweet corn, sugar snap peas and a few sun-dried tomatoes. I tossed those together with some cooked quinoa and drizzled a light citrus vinaigrette along with some fresh herbs and it made the perfect side that would pair well with any protein you like. 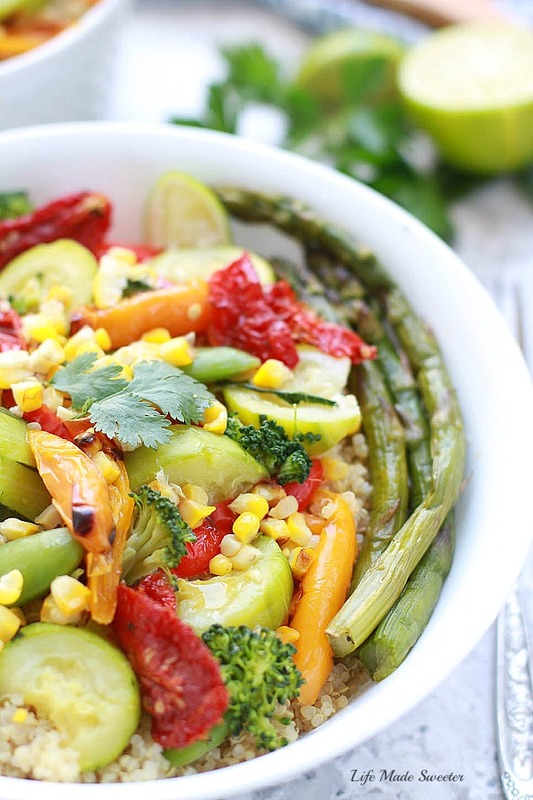 A healthy summer salad that’s so simple and delicious. 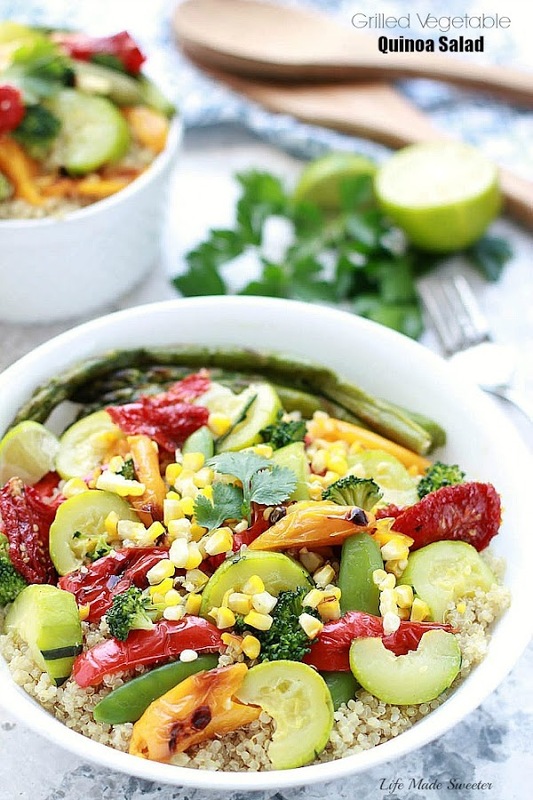 A quinoa salad loaded with grilled bell peppers, zucchini, asparagus, snap peas, broccoli. 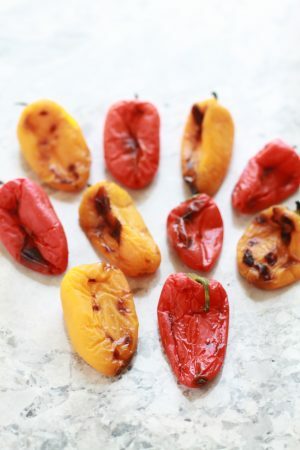 sun-dried tomatoes and corn makes a healthy and delicious light summer meal. Cook the quinoa according to package instructions, then drain really well and set aside. Meanwhile, whisk all the ingredients for the vinaigrette in a small bowl. Grill the ears of corn separately on a rear rack, away from direct flame. Rotate every five minutes or so. After 10-20 minutes, when the corn is tender, remove and set aside to cool. Strip off the husks and carefully slice the kernels off the cob. Set aside. Meanwhile, toss or brush the red peppers, yellow peppers, zucchini, asparagus. broccoli and sugar snap peas with extra virgin olive oil and season with salt and black pepper to taste. Grill peppers, zucchini and asparagus for 6-8 minutes per side, until lightly charred but still al dente. Wrap broccoli and snap peas in foil and place on the grill for 8 minutes. Remove from the grill and allow to cool slightly. Chop all of the vegetables to desired size. 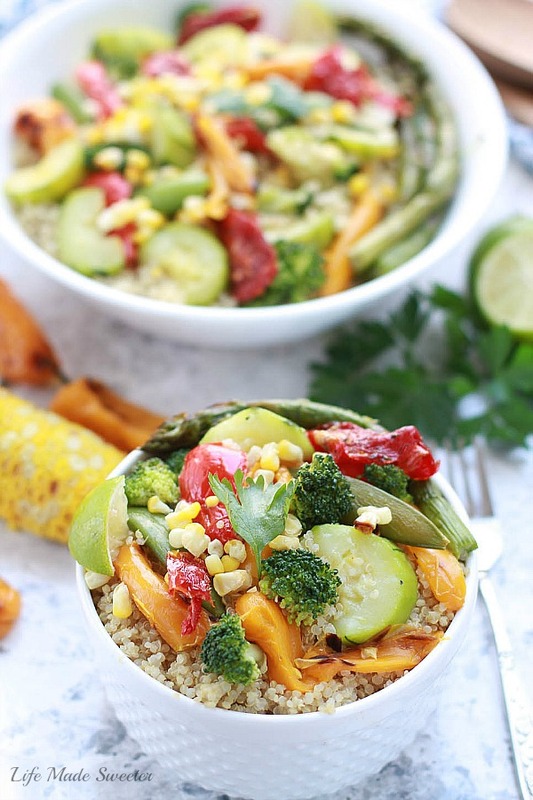 Combine the grilled vegetables, corn, sun-dried tomaotes and cooked quinoa in a serving bowl. Toss with the vinaigrette and then fold in the parsley and basil. Adjust seasoning to taste with more salt and pepper if needed. Serve warm or room temperature. To serve, you can either slice the grilled veggies and add them to the quinoa as a salad, or serve the salad the grilled veggies on the side. Disclosure: I was kindly provided with an OXO GreenSaver Produce Keeper and bags of Melissa’s Produce sweet peppers free of charge and was not compensated for my review. All opinions and recipe are 100 % my own.